I started my battle with IBS about 20 years ago. At first, I noticed that the symptoms would come up only when I was stressed, but then my symptoms got worse to the point that I was having to look for the bathroom where ever I went. It was always the first thing I looked for whenever I walked into any building. I even had colon spasms that lasted for 6 hours or more. I tried all sorts of prescriptions and I jumped from one doctor to the next. Nothing was working for me. As I was going through naturopathic school I found the answers I was looking for and I finally found real answers and real relief from my IBS. Now I can go to a store or event and be able to enjoy what I am doing instead of having to stop and find the bathroom. Since I found the answers for me. I’m sure I help relieve your IBS. I graduated from Southwest College of Naturopathic Medicine, and I have completed a residency at Las Fuentes Health Clinic in Family Practice. 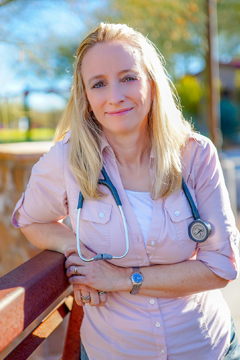 After my residency, I worked at different clinics in Arizona as a holistic family practitioner. I use an integrative approach to bring people to optimal health. My passion has always been dealing with the gut. I find it quite fascinating how the colon has all sorts of receptors for hormones, and how the colon deals with emotions. Trying to figure out the balance between physical and emotional aspects is like a jigsaw puzzle that I love to try to solve. I am a published researcher in alternative medicine, I periodically write articles on various health topics, and I give seminars to other physicians and to the public. I recently became a member of the Arbinger Professional Network. The knowledge I have gained from my years of experience has helped me to look at the person as a whole to truly help with their hormonal and gut issues.